It’s always hilarious to see kids act and say inappropirate things. The Jackass team behind Bad Grandpa are very aware of that and I assume quite a bit of their forthcoming release is centered around that premise. Here is the clip, a new poster and a synopsis. 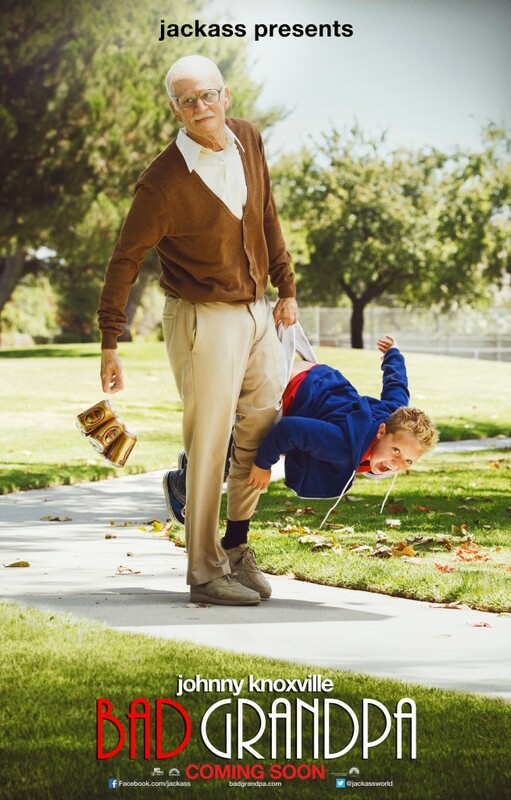 86 year-old Irving Zisman is on a journey across America with the most unlikely companion, his 8 year-old Grandson Billy in “Jackass Presents: Bad Grandpa”. This October, the signature Jackass character Irving Zisman (Johnny Knoxville) and Billy (Jackson Nicholl) will take movie audiences along for the most insane hidden camera road trip ever captured on camera. Here’s the new poster and a first trailer for Jackass’ spin off movie Bad Grandpa, starring Jonny Knoxville as Irving Zisman. Maybe not the most popular of Jackass characters and certainly not my favourite, but they seem to have mixed in real people with their pranks into a narrative reminiscent of Sacha Baron Cohen’s Borat. It certainly seems to work and the trailer looks hilarious!